The pillars are active star forming regions in the Eagle Nebula, 7,000 light years distant; the largest of the pillars has a height of about 40 trillion kilometres (4 light years). They consist mainly of molecular hydrogen and dust. These pillars will be destroyed fairly soon either by gradual erosion from the strong stellar winds from new born stars within and around the pillars or from supernovae nearby blowing away the remaining gas and dust. Scientists discovered a cloud of hot gas believed to be a shock wave from a supernova and thought to hit and destroy the pillars in 1,000 years’ time. As the light from the pillars takes around 7,000 years to reach Earth, the pillars likely have already been destroyed; we see the pillars as they were 7,000 years ago. 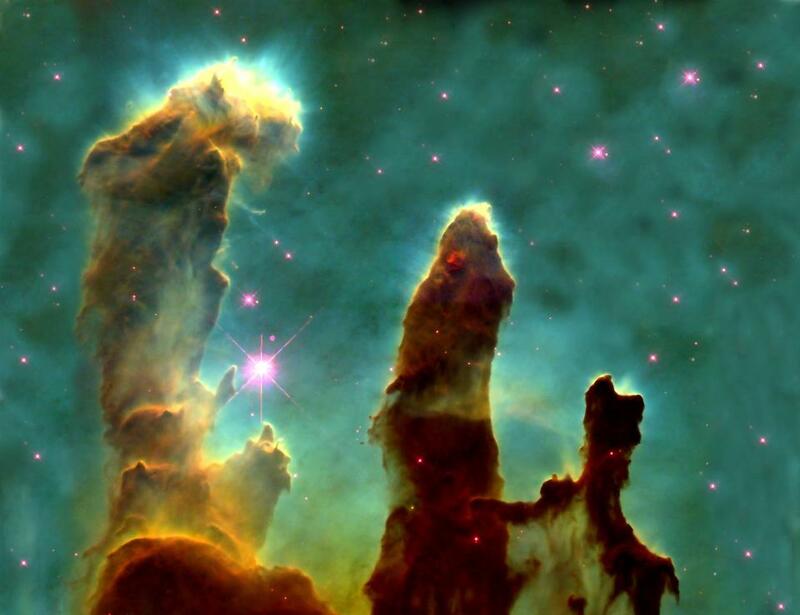 This image was taken in 1995 by NASA's Hubble Space Telescope and highlights the pillars where new stars are thought to be forming. Don't be sad, Melbs. It's all relative. Just think, thousands of years from now, a radio astronomer on some other world will detect a faint signal which at first will be interpreted as the first aign of another intelligent life form, only to be bitterly disappointed when it turns out to be Season 1 of "Laid". You are so mean but I love it. It's comforting to me, Mr E, knowing that I will be long dead when the inevitable extra-terrestrial retaliation arrives. I sometimes find the idea of universal heat death a bit sad, but then all the quiet and stillness also seems kind of beautiful in its own way too, y'know? Love the sciencey posts Melbs, and the poem, but still too busy to put much thought into comments right now. With rellies over the last few days. Young couple from up north that have recently moved to Melbourne. They've just (like a few days ago) had a job fall through and an unwelcome pregnancy come to light. You don't have any advice for getting onto health services in your neck of the woods, do you? Just thought with your line of work, you might have accumulated some useful knowledge. Family Planning Victoria, their details are online. They run clinics in Box Hill and in the CBD. Depending how young they are (if Under 25) they can drop into the Action Centre in the city, and fees are low to non-existent. FPV don't provide 'pregnancy counselling' as such but will talk about pregnancy options and can refer on. Other place would be The Royal Women's; they also do pregnancy 'options' appointments I think. I wish them luck. I probably don't have any info that's not publicly available on the Internet or by ringing these places. Thank god it's easy to get info and help. Don't worry about not commenting but I'm really happy you like the sciencey ones. I'm loving science stuff ATM. Thanks heaps, Melba. It's very much appreciated. Was just listening to Insight on SBS. The topic tonight was girls and violence, something we've discussed here before. They spent almost the entire hour getting the stories and perspectives of girls who fight. I definitely recommend checking it out online if you didn't watch it. Oh thanks I'll check it. I really don't watch tv but often catch it online afterwards. Or tape stuff. Thanks for that! Also Marie Stopes is another place the couple can contact, looks like they have a clinic or office in St Kilda and also Croydon.